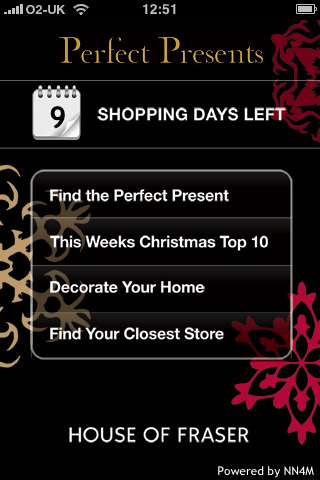 House of Fraser launched an iPhone app last week, which allows customers to search for gifts on their mobiles. Are etailers keeping customers informed about Xmas delivery? One major concern for online shoppers at this time of year is whether they will get their orders in time for Christmas, and how late they can leave it before buying presents online. There is also an opportunity for retailers here to drive sales by using persuasive ways to show the information like countdown clocks, or else catch some business from last minute shoppers by offering delivery later than the competition. The final delivery dates vary between retailers; you need to order by the 17th from the Apple Store to guarantee Christmas delivery, but you can place orders with Amazon up to 8:30 am on Christmas Eve. So how are retailers communicating this to customers?